Imagine, you have your new dream home picked out. And you are successfully under contract. In the Boulder Colorado home market, this alone can be a challenge. But, what if the sale of your own property is taking longer than expected. Then you might require a real estate bridge loan, sometimes called a swing loan, to cover the gap between desire and ability. These mortgage loans are short term financing packages. The client is borrowing against the value of his or her current property. And then using those proceeds to purchase the new place. This interim financing usually extends for six to twelve months in duration. 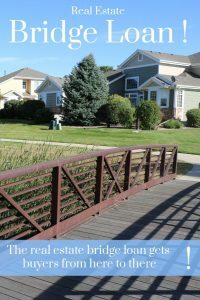 With overall home mortgage rates creeping up around the country, Boulder mortgage lenders are now offering this option more and more, with some willing to go a 90% LTV ratio. This creates great flexibility for home buyers in need of a real estate bridge loan to acquire their new home. Most mortgage bank lenders working with a client on this type o interim financing require the current property to at least be listed for sale (and in some scenarios: Under Contract). Borrowers need to be well qualified, with the ability to handle both mortgage payments. While every scenario is unique, Boulder home buyers qualifying for down payment assistance programs are better off not raiding their soon to be former property. gap financing carries some risk and generally has a set pay off period. By contrast, a down payment program rewards you for not selling your home, frequently not requiring the borrower to repay the loan. Gap loans are not for every home buyer. But they can be a good solution for some. Buyer Alison falls in love with a new construction home. She goes under contract but the house is not going to deliver for ten months. She lists her house for sale 3 months before the planned closing, but its not selling. Alison doesn’t want to lose the new home, nor is she willing to dramatically reduce the price on her existing house. The real estate bridge loan allows her the flexibility to still close on her new construction dream home and have time to sell her existing property for top dollar. Bob Gordon is a Realtor in Boulder Colorado. Actively blogging since 2012 and licensed to sell real estate since 1995. Working with new, repeat and referral clients, you can reach Bob at 303-443-3334 or by requesting more information now. Interesting! I’m facing this exact situation in St. Louis where we’re about to list our current home, but already have our eyes on other properties to buy, and plan to use 50% of the current home sale proceeds as down payment.